Emmegi (UK) has supplied a Tekna 944 4-axis machining centre to Devon based Camel Glass. The long established fabricator has become the latest company to benefit from the Emmegi group’s acquisition of Tekna back in 2016, which has given Emmegi customers in the UK access to a much broader range of machining centre options. The Tekna 944 machine was the main attraction on the Emmegi (UK) stand at the MACH manufacturing show at the NEC in April, impressing visitors with the speed and precision of it in operation. It is a powerful machining centre suitable for drilling, milling and threading large sections of both aluminium and steel. The electro spindle moves along the A axis, allowing machining through a full 180° around each section and, while it is a short bed machine, it has a useful wide workable section of 1070mm. A clamp unit ensures the correct positioning of sections even at this extended width and counterblocks can be mounted quickly and accurately. A 12 piece tool magazine on the gantry gives customers maximum flexibility and reduces tool changeover times to optimise the productivity and efficiency of the machine. Camel Glass has four production facilities across Devon and Cornwall producing a comprehensive range of doors, windows, sun rooms, architectural glazing and glass balustrades for trade, retail and commercial customers. 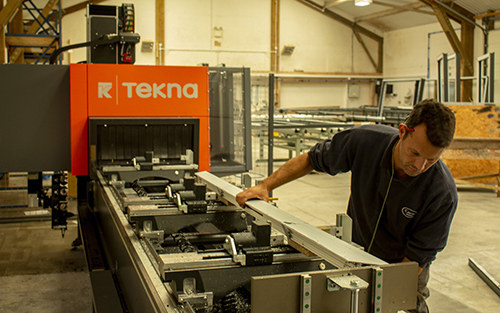 The Tekna 944 machining centre has been installed at its Holsworthy factory where it manufactures frames in Schüco, Senior and Reynaers systems.